8 oz (237 ml) bottle universal/ester A/C dye TRATP3840-8 Brand New! We have warehouses in multiple states. We will provide you with that information. 8 oz (237 ml) bottle R-134a/PAG A/C dye TRATP3820-8 Brand New! Services up to32 vehicles per 8 oz bottle. We have warehouses in multiple states. We will provide you with that information. 8 oz (237 ml) R-134a/PAG BigEZ A/C dye cartridge TRATP9760-8 Brand New! 8 oz (237 ml) OEM-Grade R-1234yf/PAG BigEZ TRATP9725-8 Brand New! These are a single use professional formula deep cleaning aerosol. It eliminates bacteria, viruses, mould and fungi that can develop within the vehicle air conditioning system, air vents and vehicle interiors including carpets and upholstery. Canisters of Genuine NATIOANL A/C Pure R134a Refrigerant. New Genuine NATIONAL. Auto Air Conditioner. Item pictured is actual item that will be received. Oil, compressor - HELLA 8FX351213041. BEHR HELLA SERVICE: 351213041. Oil Viscosity Classification SAE: ISO 150. Quantity Unit: Piece. Replaces following reference(s) (We can mark the item as a 'gift' if requested to, but we will not declare any different amount). 8 oz (237 ml) universal/ester BigEZ dye TRATP9770-8 Brand New! New BG Chemicals No 709 FRIGI-CLEAN A/C Evaporator Service Cleaner 9oz. 9oz Can Only. 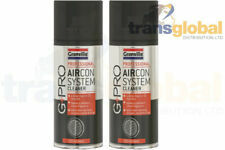 BG Frigi-Clean® • Freshens interior airFOR PROFESSIONAL USE ONLY. • Makes cold air colder. Type: R134a Systems Refrigerant Oil. Specially formulated for use in R4 and A6 compressors in R-134a refrigerant systems. Approved for use in GM-Harrison manufactured compressors using R-134a refrigerant oil. FOR SALE IS A SET OF A/C PRO SUPER SEAL AND A/C STOP LEAK. EACH OF THE CANISTERS IS 3oz AND INCLUDES SEVERAL HOSE / GAGES. You will not be disappointed. PAG Oil 46 w/Dye - Gallon FJC2501 Brand New! Part Number: 2501 FJC2501. PAG Oil 46 w/Dye - Gallon. We have warehouses in multiple states. We will provide you with that information. Universal A/C Dye - 12 Bottles UVUB499012 Brand New! Part Number: B499012 UVUB499012. This fast, convenient and cost effective UV Dye is used to pinpoint leaks in A/C systems. There are 12 bottles of universal A/C dye, and the service stickers are included. Spotgun Jr. R-1234YF Hose Assembly with Coupler UVU471547 Brand New! Spotgun Jr. Part Number: 471547 UVU471547. R-1234YF Hose Assembly with Coupler. We have warehouses in multiple states. We will provide you with that information. Oil, compressor - HELLA 8FX351213051. BEHR HELLA SERVICE: 351213051. Oil Viscosity Classification SAE: ISO 100. Quantity Unit: Piece. Replaces following reference(s) (We can mark the item as a 'gift' if requested to, but we will not declare any different amount). Tracker A/C Leak Detection Kit ROB16235 Brand New! Part Number: 16235 ROB16235. Kit includes: Injection gun, fluorescent light, fluorescent leak detection dye, fluorescent dye cleaner, UV glasses and blow molded case. Oil, compressor - HELLA 8FX351213061. BEHR HELLA SERVICE: 351213061. Oil Viscosity Classification SAE: ISO 46. Quantity Unit: Piece. Replaces following reference(s) (We can mark the item as a 'gift' if requested to, but we will not declare any different amount). 8 oz. (237 ml) Bottle Synthetic or Petroleum-Based Fluid Dye - Glows RED New! Oil based fluid dye. Use 1 oz per 4 gallon. Fluoresces RED. SOLO-SHOT Universal A/C Leak Detection Kit TRALF020CS Brand New! Part Number: LF020CS TRALF020CS. SOLO-SHOT Universal A/C Leak Detection Kit with (2) single-use disposable syringes, pre-filled with LeakFinder® Universal Dye, R-134a hose/coupler and purge fitting . Oil, compressor - HELLA 8FX351213081. BEHR HELLA SERVICE: 351213081. Oil Viscosity Classification SAE: ISO 100. Quantity Unit: Piece. Replaces following reference(s) (We can mark the item as a 'gift' if requested to, but we will not declare any different amount). ACDelco - 105026. R12 Refrigerant Oil. Fully synthetic ACDelco Air Conditioning Compressor Oils (46 Viscosity) are formulated to provide unsurpassed lubricity, wear protection, and proper miscibility with ozone-friendly refrigerants like R-134a (except for R4 and A6 systems), as well as R-12 in the case of retrofits. Universal A/C Dye with eBoost - 8 oz. Cartridge UVU499109 Brand New! Universal A/C Dye with eBoost - 8 oz. Part Number: 499109 UVU499109. When used in an air conditioning system, eBoost™ will increase the lubricity and anti-wear properties of the oil and rejuvenate rubber seals and O-rings, thereby helping extend the life and performance of the A/C system and compressor. Universal A/C Dye 8oz FJC4917 Brand New! Part Number: 4917 FJC4917. Universal A/C Dye 8oz. We have warehouses in multiple states. We will provide you with that information. Mini-EZ Hybrid Dye Replacement Cartridges - 3 Pack TRATP-9811-0301 Brand New! LeakFinder (6) 1-oz (30 ml) bottle, oil dye TRALF2001 Brand New! Part Number: LF2001 TRALF2001. Single bottle services 1 vehicle. Finds leaks in oil, fuel, ATF and power steering systems. We have warehouses in multiple states. We will provide you with that information. We have warehouses in multiple states. We will provide you with that information. Part Number: 2481 FJC2481. PAG Oil Injector ROB18480 Brand New! Part Number: 18480 ROB18480. Labelled for R134A PAG Oil. Inject PAG oil into an R134A A/C system. The 18480 R134A oil injector labeled for PAG oil allows operators to avoid oil cross contamination when adding oil to an A/C system. R1234yf Dye Kit Assortment FJC4972YF Brand New! Part Number: 4972yf FJC4972YF. 6 bottles of R-1234yf Dye. We have warehouses in multiple states. We will provide you with that information. RELOAD Refillable Syringe Leak Detection Kit TRALF180CS Brand New! Part Number: LF180CS TRALF180CS. Includes: LeakFinder® cordless, blue light LED leak detection flashlight,A/C dye syringe injector. We have warehouses in multiple states. We will provide you with that information. Dye Injection Kit ROB16355 Brand New! Part Number: 16355 ROB16355. This dye injection kit is for those who already have a UV lamp, yet want to have the best kit in UV detection. Injection gun with R-134a hose and R-12 adapter. R134A Oil Injector ROB18490 Brand New! Part Number: 18490 ROB18490. Using a dedicated oil injector avoids cross contamination. Labelled for POE oil. Suit hybrid and electric compressors using POE oil. Universal A/C Dye 1/4 oz FJC4914 Brand New! Part Number: 4914 FJC4914. Universal A/C Dye 1/4 oz. We have warehouses in multiple states. We will provide you with that information. Spotgun Jr. "Single Shot" Cartridges (Quantity of 6) UVU399006 Brand New! Part Number: 399006 UVU399006. We have warehouses in multiple states. We will provide you with that information. Replacement LeakGuard Cartridge, 1 oz, Use with Eco-Twist Injection System New! We have warehouses in multiple states. We will provide you with that information. Part Number: 480301EU UVU480301EU. Oil, compressor - HELLA 8FX351214221. BEHR HELLA SERVICE: 351214221. Oil Viscosity Classification SAE: 68. Replaces following reference(s) (We can mark the item as a 'gift' if requested to, but we will not declare any different amount). Oil, compressor - HELLA 8FX351214101. BEHR HELLA SERVICE: 351214101. Oil Viscosity Classification SAE: 68. Replaces following reference(s) (We can mark the item as a 'gift' if requested to, but we will not declare any different amount). UltraTraceUV Dye Smoke Solution 6285 (16 OZ) OTCP-0716 Brand New! UltraTrace UV dye will not void factory warranty. The only solution approved by GM, Ford and Chrysler. We have warehouses in multiple states. We will provide you with that information. Oil, compressor - HELLA 8FX351214201. BEHR HELLA SERVICE: 351214201. Oil Viscosity Classification SAE: 68. Replaces following reference(s) (We can mark the item as a 'gift' if requested to, but we will not declare any different amount). Spotgun HFO Oil Injection Kit UVU481500YF Brand New! Part Number: 481500yf UVU481500YF. The world's leading Spotgun Injection System. Oil, compressor - HELLA 8FX351213131. BEHR HELLA SERVICE: 351213131. Compressor Oil: PAG 100. Replaces following reference(s) Body & Trim. (We can mark the item as a 'gift' if requested to, but we will not declare any different amount). Universal A/C Dye - 12 1/4 oz. Bottles TRATP384012025 Brand New! Universal A/C Dye - 12 1/4 oz. Part Number: TP384012025 TRATP384012025. The fluorescent dye is added to the system and circulated. The system is then inspected with the lamp. Since the dye collects at all leak sites, the lamp will show the precise location of every leak with a bright glow. QASHQAI 2014 -2018 Mk2 (J11). NISSAN QASHQAI Misc. 2016 NISSAN QASHQAI which we are dismantling. AIRCON PIPES COMPLETE ;. The Part imaged and described is th eactual part you will recieve. Engine Power. Oil, compressor - HELLA 8FX351214281. BEHR HELLA SERVICE: 351214281. Oil Viscosity Classification SAE: 100. Replaces following reference(s) (We can mark the item as a 'gift' if requested to, but we will not declare any different amount). DyEstercool Oil-(Gallon) FJC2447 Brand New! DyEstercool Oil-(Gallon). Part Number: 2447 FJC2447. We have warehouses in multiple states. We will provide you with that information. Oil, compressor - HELLA 8FX351214081. BEHR HELLA SERVICE: 351214081. Oil Viscosity Classification SAE: 100. Replaces following reference(s) (We can mark the item as a 'gift' if requested to, but we will not declare any different amount).